Back in July last year, we made some pretty big changes. We rebranded and created an entirely new identity: we changed our name, logo, and look. All these changes were made with one goal: to improve how business relationships are built and nurtured. Hey, we’re in the Relationship Era after all. While most of our visual identity (our website, our ads…) got a new look, one piece was missing: the product that we are so proud of. Today, we’re changing that and starting the new year with a fresh new look. 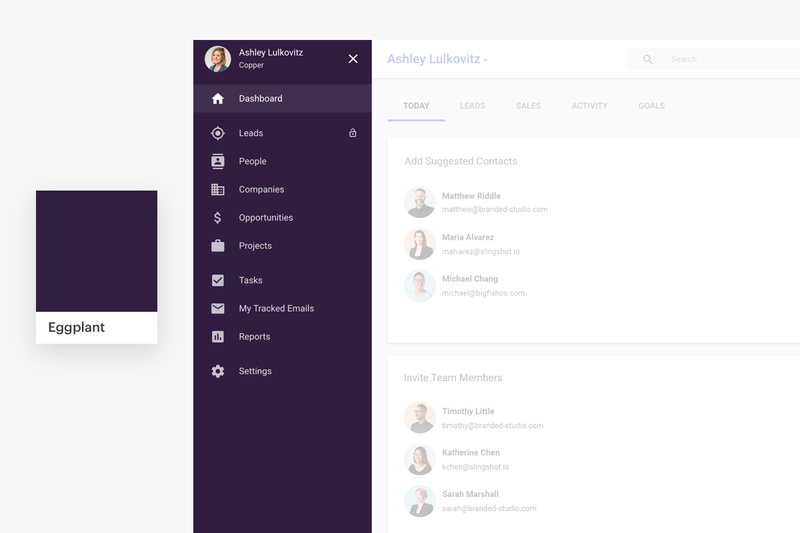 Our Product team has been working hard to make sure that our product matches our brand identity in a way that keeps our core principle in mind: be a CRM that’s built for you, the end-user. Ready to learn more about what’s changing and why we did it? As we mentioned, this new look is the second phase of our rebrand. It won’t change anything about the way you navigate through Copper. It’s simply an update to our web app and Chrome extension to swap in our new colors. The left navigation bar (aka. the main menu) in the app is changing from dark grey to Eggplant. Eggplant is the new shade of purple you’ve probably seen us use quite a lot. It’s a cornerstone color of our brand! 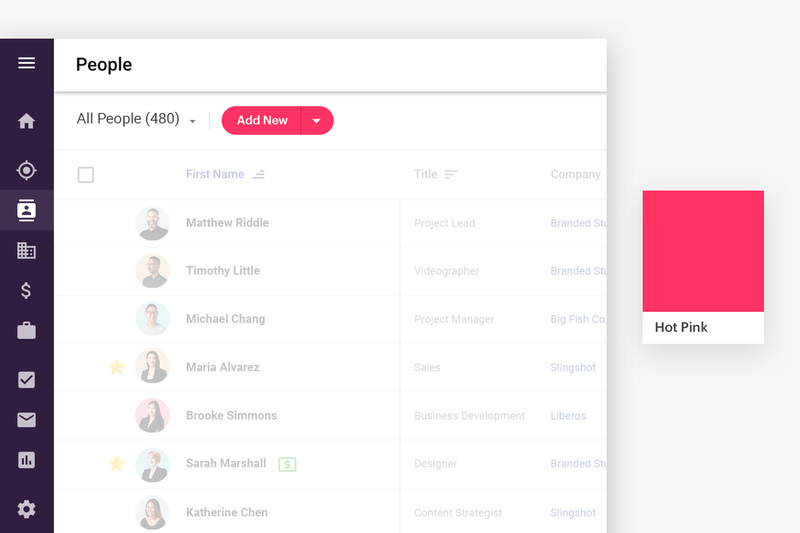 They aren't live quite yet, but over the next few weeks, you'll see action buttons like ‘CONVERT LEAD’ or ‘ADD NEW’ on leads, people, companies, opportunities, and projects go from light blue to Hot Pink. Hot Pink is another cornerstone color of our brand. It’s the new color of our logomark and accented in our logo! You’re also wondering...what about the app bar that houses the search bar and other actions across the top of the app? Previously, each page (leads, people, companies, etc.) had its own color. It’s now completely white for better readability. You’ve probably noticed the login page of our Chrome Extension got the Copper treatment back in October. This second phase of our rebrand brings the Copper makeover to the rest of the extension. All of these changes mirror the changes that you’ll see in the web app. Links, tabs, and text fields are all now Midnight. Buttons such as ‘ADD TO COPPER’ and ‘CONVERT LEAD’ will be Hot Pink in the coming weeks. The image below gives you an idea of what you should see in your Copper Chrome extension today. Well, back in July, we rebranded to better align with our vision of facilitating the future of relationships and productivity. Until today, the product just didn’t quite match up with that new brand and the customer experience we wanted to. As a direct extension of our brand, we want to make sure that Copper, the product, shares the same language and personality. Data is important, yes, but it’s about time that we turn the spotlight to focus on relationships, something that’s been missing in CRMs for a very long time. To kick off the update of Copper’s product colors, we created mood boards. (Pro-tip: mood boards are great for getting a clear understanding of the best qualities and characteristics of a new brand.) This helped us uncover how we wanted to express ourselves through our product and how we wanted our product to feel when it is used. • Bold, not LOUD - Yep, there’s a difference. • Inviting - Because we’re so relationship-focused, it’s essential that Copper feels inviting and warm. It’s not what many other CRMs believe, but we think that a CRM should draw people in and be something that people actually want to use. • Modern and mature - Many big CRMs today were born in the ‘90s (and they look like it too). We wanted to create something that’s easy on the eyes, yet still all about business. • Open to all - Sales is traditionally a male-dominated industry and many tools don’t reflect how modern teams are evolving today. We believe that the most successful businesses of the future will be the ones that embrace diverse perspectives and backgrounds. • Quality - For us, when something is a quality product, there’s subtle detail and depth to it. Everything we create is deeper than the surface, with multiple outcomes considered. 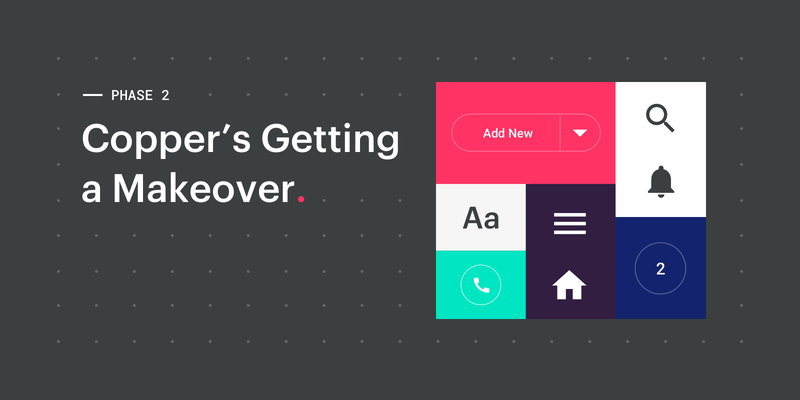 Once those themes were clear, we moved into various color explorations, which helped us find the best balance of color, as well as colors that would help create a clear hierarchy within the app. 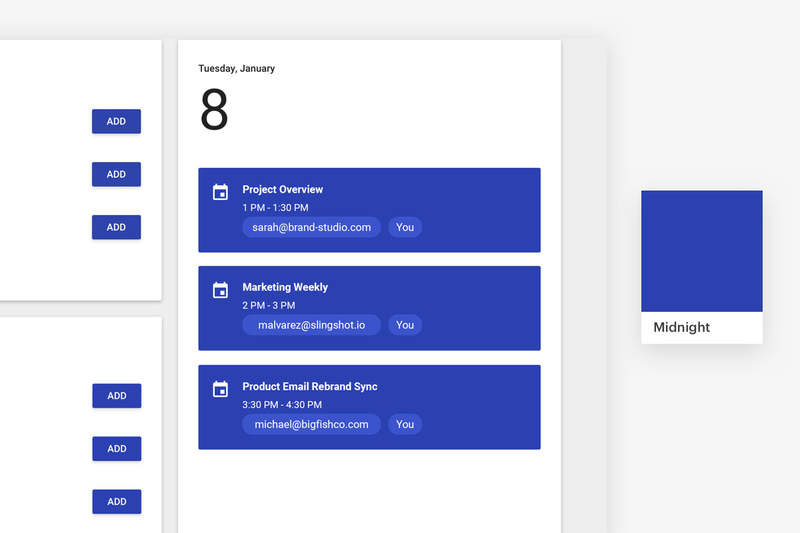 From there, we explored colors within the product itself, testing out different colors in various parts of the app until we landed on one that aligned with the themes mentioned above. Product Design: Ariel N., Brittany H., Steve H., AJ M.
Brand Design: Astra S., Ashley L.
Development: Smith S., Matthew M.
For the next stage of our rebrand: the mobile apps! 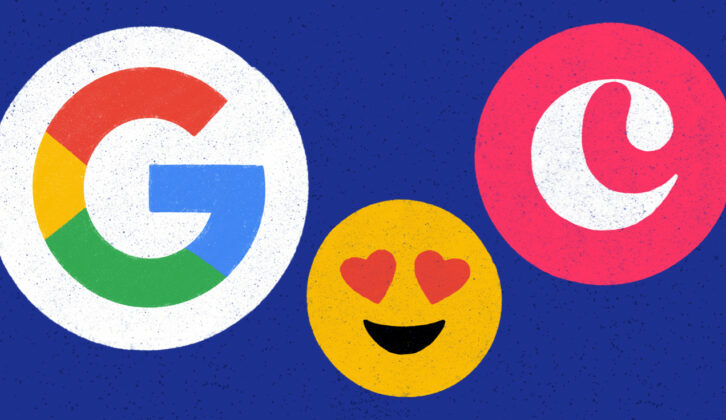 (Yes, we have one for iOS and Android.) Along with the mobile apps, we’ll continue to make adjustments in the product to optimize for the best user experience. You'll see small changes ahead as we receive customer feedback. Stay tuned! 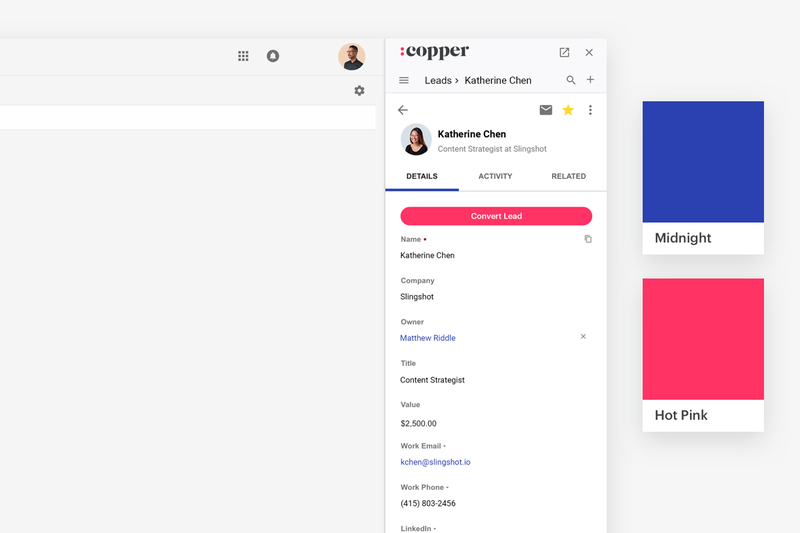 See how Copper CRM has deepened its integration with G Suite including Gmail, Calendar & Drive, making it easier to track customer + prospect relationships. New Name, Who Dis?—Now You Can Rename Records in Copper! With the latest release of Copper, you can now rename the main records in your CRM to better suit your specific business terminology. 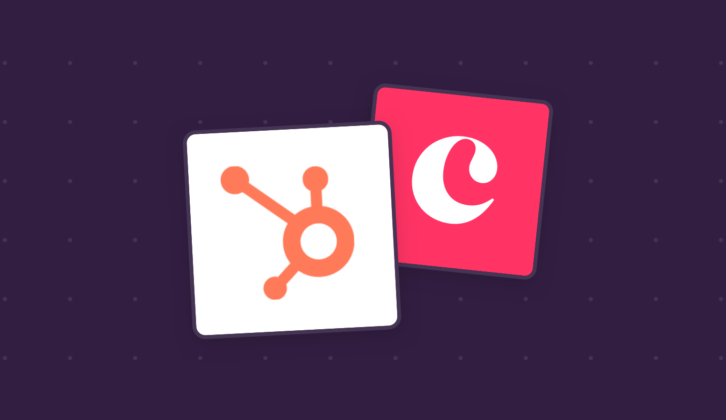 Copper + HubSpot, Can You Name a Better Pair? 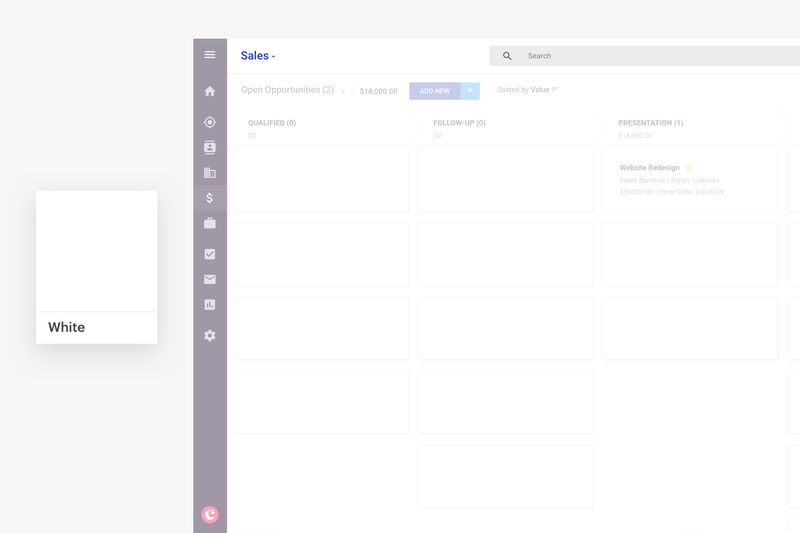 Meet the Copper + HubSpot integration designed to help align sales and marketing teams.